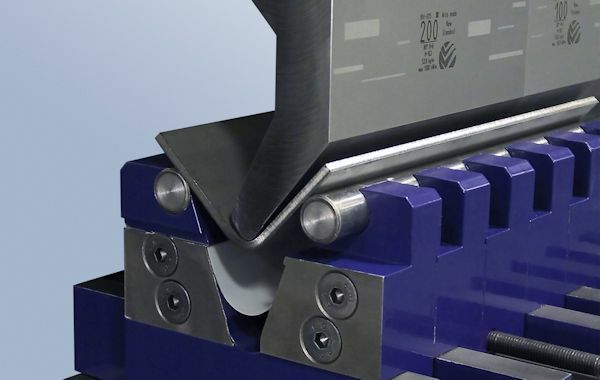 The latest advances in adjustable V dies have finally brought the kind of flexibility to plate bending that those in the precision sheet metal arena have enjoyed for years. Over the past four decades, high-precision, quick-change tooling; single-operator tool loading/unloading; and the ability to store tooling in a lockable cabinet at the press brake have become the norm for a large percentage of sheet metal fabricators that fabricate parts from 20-gauge through 1⁄4-in.-thick mild steel. These innovations have helped many to realize tremendous gains in productivity. Unfortunately, during that same period, an equally large percentage of fabricators that produce parts made of thick plate have realized very little in the way of productivity gains. In fact, it is still common for press brake operators, along with operators that have been pulled from other machines to assist in setup, to spend as much as an hour or more changing very large, heavy, and often worn-out punches and dies. No doubt much of this is due to the fact that, until recently, plate fabricators had few tooling options to reduce setup times and improve their productivity. Fortunately, the latest advances in high-precision, adjustable V dies help change all of that. Read the whole article that is published in 'the Fabricator'.